To believe BC Liberal rhetoric on fuel prices in BC, the NDP are responsible for the highest gas prices in North America. Facts however, tell another story. While it is true that the carbon tax in BC went up by a penny, that's hardly the explanation for the recent dramatic jump in price. There are several factors. Regional governments, city halls, transit authorities all have a hand in adding layers of taxation to fuel costs in BC. To believe the BC Liberal version of this: the NDP is responsible for 100% of this tax burden. 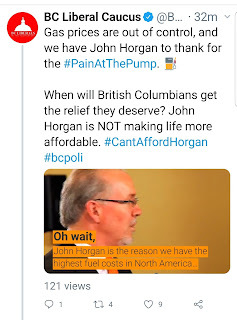 What's even more asinine is the failure to build Kinder Morgan that the NDP opposes is also responsible for this fuel price overload. Would someone please tell the BC Liberals that the expanded Kinder Morgan project is for export only? Today, I’m happy and honoured to offer my unqualified endorsement to Lauren Semple for the Federal NDP nomination to the Nanaimo-Ladysmith ballot this fall. I have worked with Lauren in the community for 4 years now and I have only known her to be a tireless and fearless advocate on human rights and worker rights. In my background in the labour movement, Lauren and I share a similar vision of ‘what we demand for ourselves, we wish for all.’ As Lauren is the past President of Nanaimo Pride Society, this extends to all corners in our society as she championed the cause for equality; for women, for LGBTQ folks, justice for First Nations and many other marginalized peoples. Voters have stark choices to make in the 2019 election. Voting for Lauren Semple is a vote to defend our coast, champion fair taxes and adequate housing. To listen to the BC Liberals this morning about the good old days of the last 16 years is a step outside reality. They're accusing the NDP of taking BC backwards with the new budget. Nothing could be further from the truth. 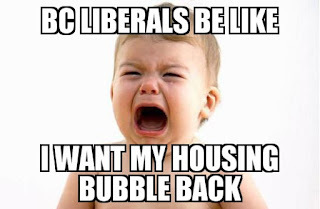 Its because the BC Liberals's mishandling of the real estate market that life became so unaffordable for so many. The NDP are out of touch with families & everyone trying to make a living in BC. With fewer homes being built, govt spending growing faster than the economy & punishing new taxes, BC is falling behind. True to form, opponents of the new Employer Health Tax are leaping all over a report where the Victoria police chief states that his departments budget increase isn't large enough so he'll have to cut staff. The city comes up with an additional $1.8 million and the EHT cuts into that by about $700k. So his effective increase is $1.1 million. Amiright? So, explain why this amounts to a budget cut of $1.1m? "Manak said council’s position would mean about a $1.1-million cut to the department’s core budget, including the loss of two officers working on integrated teams to help people with mental health and addictions issues"
I get that politics are at play here, but if you're not going to deal in facts, then y'all need to sit down. I am reminded by the BC Liberals behavior of the Republicans after the roll out of ObamaCare in the USA. They screamed socialism, big government, and a whole lot of other unsavory epithets towards President Obama and the Democrats just for the sin of trying to extend out the universality of healthcare coverage in America. The sin? The individual mandate; where every uninsured American was obligated to seek out insurance. To meet that legal requirement, several states and separately the Federal Government unveiled a subsidized exchange where individuals would be able to purchase a healthcare insurance plan - or subsidized one if they qualified. 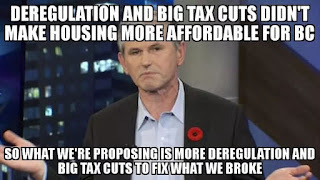 The Speculation Tax isn't healthcare, but its to address a problem that was left to fester while the last government was still in office.